You can learn a lot about a society by the way people drive. The problem is I’m just not sure what that is. 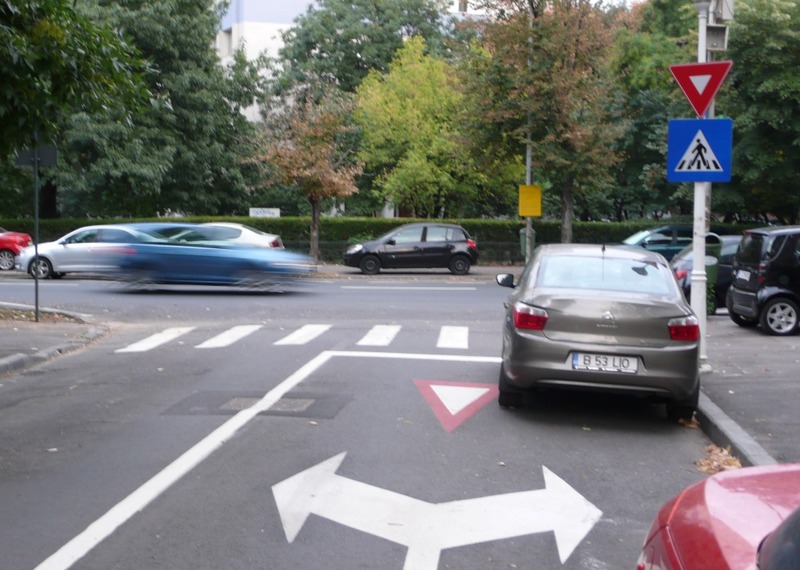 as your car sped forward and you flew down the streets, you knew all was ok because everyone was doing it, like the instinctive fluid motion of a school of big fish. you knew whichever car’s bumper was the first one to arrive had just won the right to move the next inch. There was competition to be sure, but never did I find it aggressive or mean. the drivers were lost, so you were always in good shape if you had any idea where to go. In England, simply put, driving was boring. Except for the fact that everything was on the wrong side of everything, traffic moved politely as if everyone was waiting in a 60-mile-per-hour queue. Even driving a taxi 12 hours a night in Philadelphia was ok. It wasn’t the traffic and other drivers you worried about anyway. It was the ranting, gun-wielding passengers – who were almost as scary as the Yellow Cab’s Teamster bosses. But then slowly you learn that to survive driving here, you must master only two things. Yes, only two things. Firstly, you have to assume that everyone is driving rationally and carefully just like you and then you must dismiss that thought entirely and instead anticipate them doing precisely the opposite of whatever you would expect. 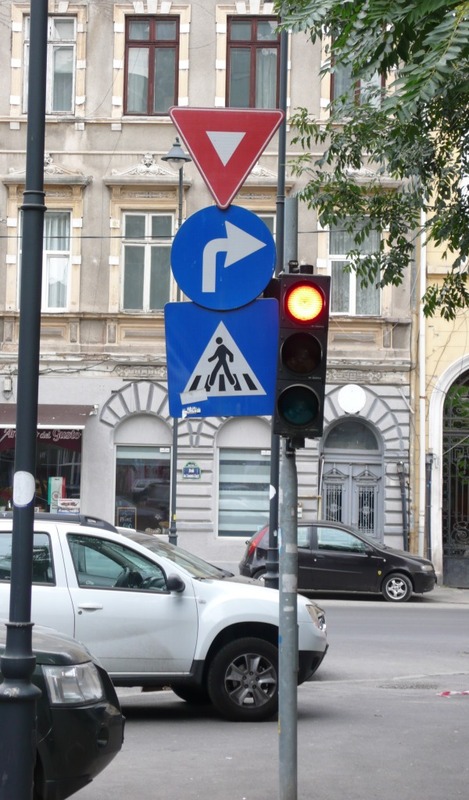 With no right on red allowed here, you apparently have to wait to yield until you have the green light. After you do that, then you’ll discover that whatever you’re now thinking is also not at all what they’ll do and instead you should anticipate that what’s most likely to happen is whatever is inconceivable for you to imagine them doing. And finally, you learn that’s not what they’ll do either. Once you know this, you’ll begin to be fine. 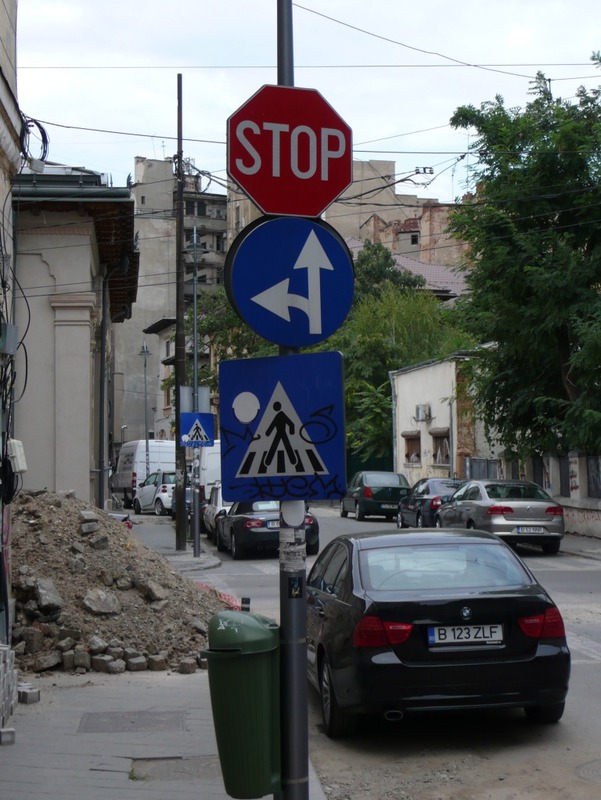 One of the three Stop signs in Bucharest. you that in seconds an old lady is about to step in front of your car. Got it? Ok. Now that you understand this, let me tell you the really strange thing about driving here. There are no Stop signs. That’s right. And when I say there are none, of course, I mean I’ve seen three. 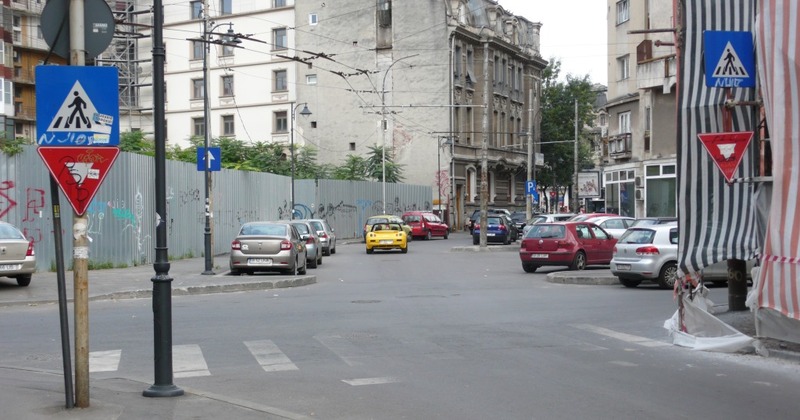 In the entire city of 2 million people, each of whom appear to drive eight or nine cars. Yes, three – and two of them were in the same place. Don’t ask me why. 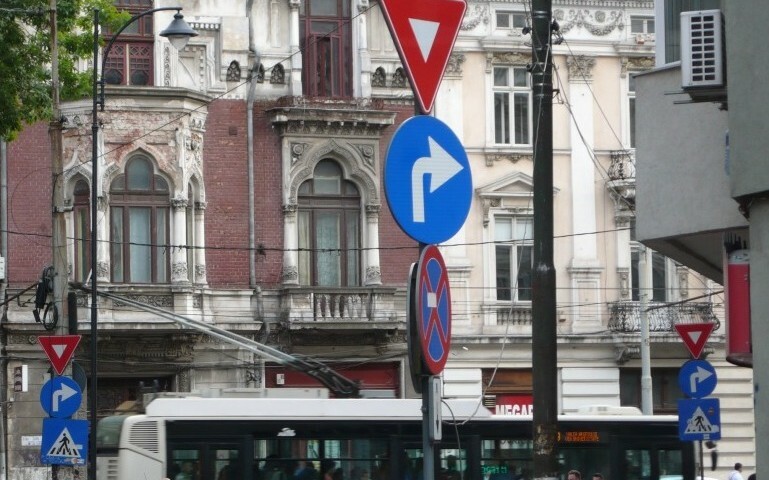 For some unknown reason having to do with the homogenous Dacian-Latin-Saxon-Slavian-Magyan culture or perhaps an endemic genetic Bucharestian fear of octagons, the idea of Stop signs apparently never arrived here. Personally, my theory is that everyone expected the Americans to bring them when they got here at the end of World War II – and we know how that worked out. Now, for those of you who have never driven between here and the US, let me tell you that in America there are Stop signs everywhere. Even in parking lots and alleys and at the end of one-way streets. If there’s room, there’s a Stop sign. It’s part of our national philosophy: “If in doubt, make them stop.” (And if you’ve seen recent stories about our police, you know what I mean.) And if we don’t make you Stop, then we tell you to Go. No weak, in-between indecision for us. No sir. Because as Americans, you should know, it’s always more important to make a definite decision than to worry about being right. And the fact is, in most of this country, there are plenty of Stop signs. Yet here? 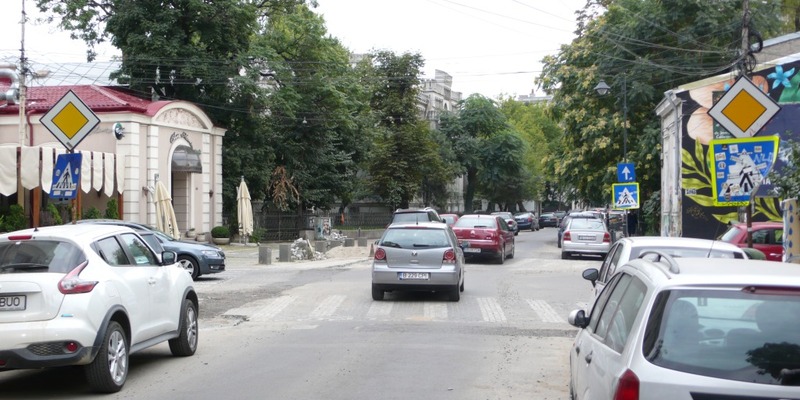 Instead, in Bucharest, everywhere, you are ordered to Yield. Not Stop. Not Go. Just Yield. In other words, don’t stop unless you have to – and if you do have to, then go ahead and pull out into the intersection and make the other guy yield to you. I have no idea what these yellow boxes mean, but if I were you, I would yield here, too.